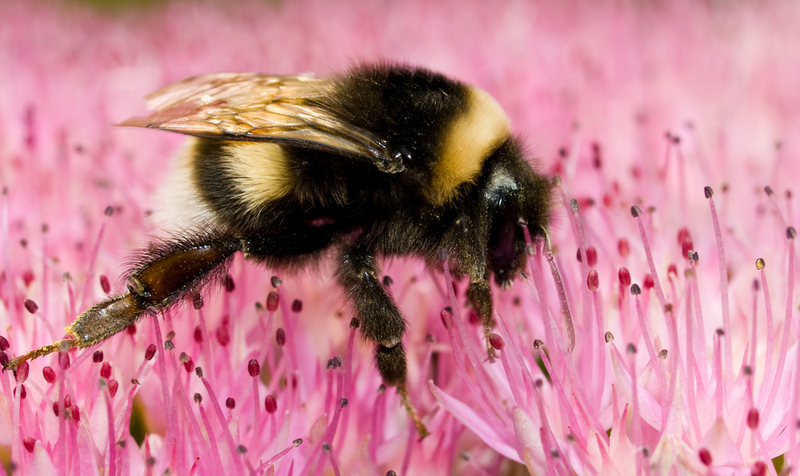 Bumblebees face their share of hazards – habitat loss, disease, and harmful pesticides among them. New research shows that climate change is also a significant threat to bumblebee populations in Europe and North America. In fact, University of Ottawa scientists suggest that, for these bumblebees, climate change may be the biggest threat of all. Findings were based on more than 420,000 observations of 67 bumblebee species collected in North America and Europe over 110 years. Location charting and thermal mapping revealed that climate change is forcing bumblebees into a “climate vice” – with the southern limits of their habitat moving farther and farther north, while their northern limits remain fixed. Unlike many insects, bumblebees’ furry coats allow them to adapt to cooler temperatures – but this also means they can easily overheat. As global temperatures rise, bumblebee species have been relocating to cooler areas, with some moving nearly 200 miles north of their native habitat. The same phenomenon has been observed in other insects. But while most also compensate by expanding their northern borders, bees seem unwilling or unable to do so. Instead, they remain stuck in an ever-shrinking habitat. It’s not surprising, then, that bumblebees in Europe and North America are declining at a rapid rate. Scientists believe bumblebees’ hesitance to colonize habitat to the north has more to do with vegetation than temperature. Bees prefer open grasslands and are unlikely to move, for example, into the Canadian forest. The paper’s authors suggest conservation measures, among them ‘assisted migration’ and the creation of safe havens. The study is an important reminder that valued species may be unable to shift their ranges fast enough to adapt to our changing climate. Photo, posted September 25, 2008, courtesy of William Warby via Flickr. Earth Wise is a production of WAMC Northeast Public Radio, with script contribution from the Cary Institute of Ecosystem Studies.